There’s a lot to look at in Las Vegas – flashing neon lights, dancing fountains, crowds of interesting people walking by. The only thing that makes taking in the sights better is doing it while enjoying a nice meal. There are lots of Vegas restaurants in town that offer amazing vantage points, whether it’s because of their view of the Strip or their prime people-watching real estate. Here are a few of our favorite places to dine with a spectacular view. 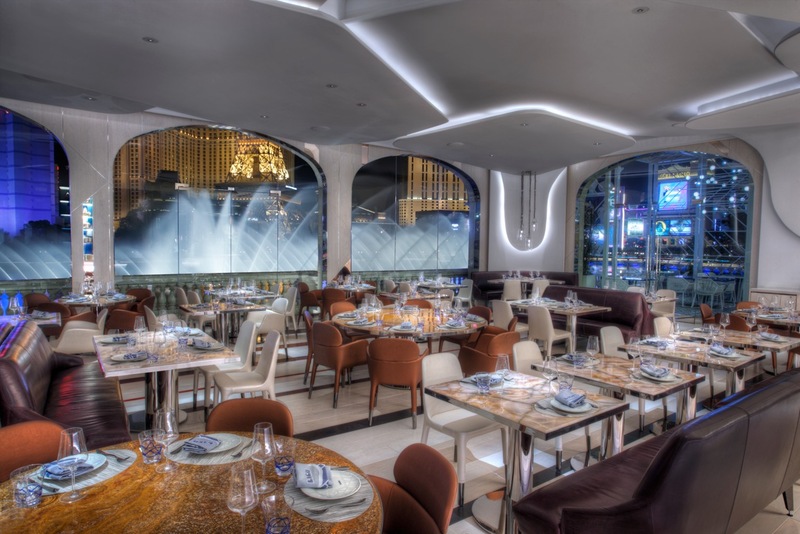 The fittingly named Lago from star chef Julian Serrano overlooks the lake and fountains in front of the Bellagio hotel through floor-to-ceiling windows. There’s also a fantastic view of the Eiffel Tower at Paris Las Vegas across the street. If you want to hear the music playing along with the fountains, reserve a table on the beautiful, intimate outdoor patio. The restaurant isn’t all about the surroundings though – it also serves some amazing small plates featuring imaginative takes on Italian cuisine. Try the red wine risotto with burrata. You can thank us later. When you come to Vegas for a special occasion, you have to dine at the Eiffel Tower restaurant. Set 11 stories above the Las Vegas Strip, the Eiffel Tower restaurant is romantic, inspiring and a perfect place to celebrate a birthday, anniversary or proposal. For breathtaking views of the Las Vegas Strip and Bellagio Fountains across the street, ask to sit at a table beside the floor-to-ceiling glass windows. However, there isn’t a bad seat in the house. Enjoy your view with eclectic French and American cuisine from chef Jean Joho. The Stratosphere Tower is the tallest building west of the Mississippi so you’d expect some pretty amazing views and the restaurant at the top — aptly named Top of the World — delivers. 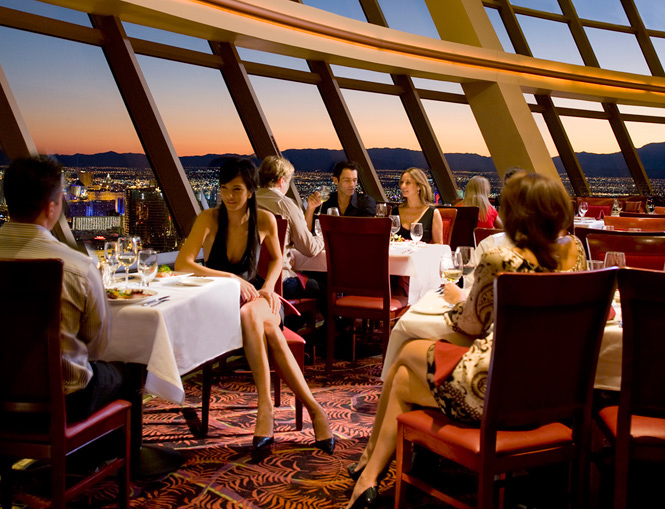 Take the elevator more than 800 feet above the Strip to the restaurant, which features angled floor-to-ceiling windows. Sure, that’s spectacular, but as you dine you’ll also rotate 360 degrees throughout your meal, giving you views of the Strip, mountains, downtown and the whole valley. During the 80-minute rotation you’ll enjoy gourmet food and first-class service for lunch or dinner. The menu includes seafood, steaks, pasta and more. There’s also a four-course tasting menu available. 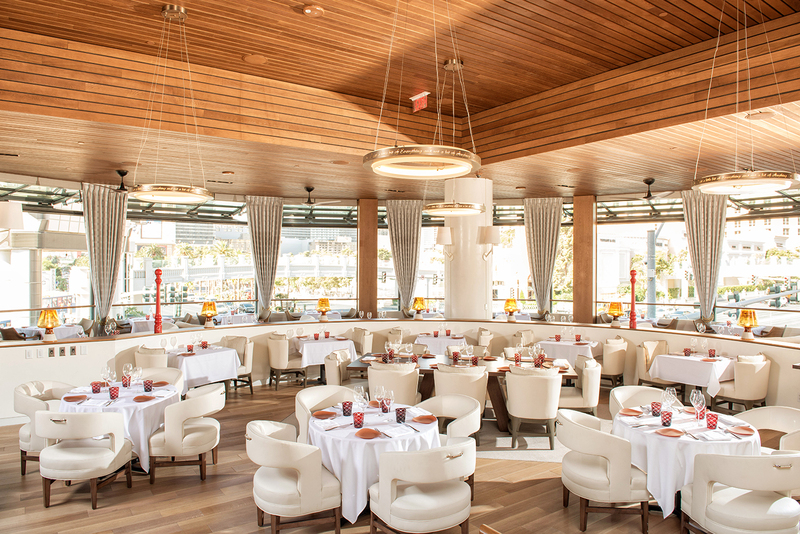 Celebrity chef and TV personality Giada De Laurentiis chose to open her first restaurant, Giada, at The Cromwell in Las Vegas last year and it’s been a huge hit. The cuisine embraces her passion for Italian cooking with lighter California influences. Guests can enjoy De Laurentiis’ signature dishes, family recipes and an antipasto station. 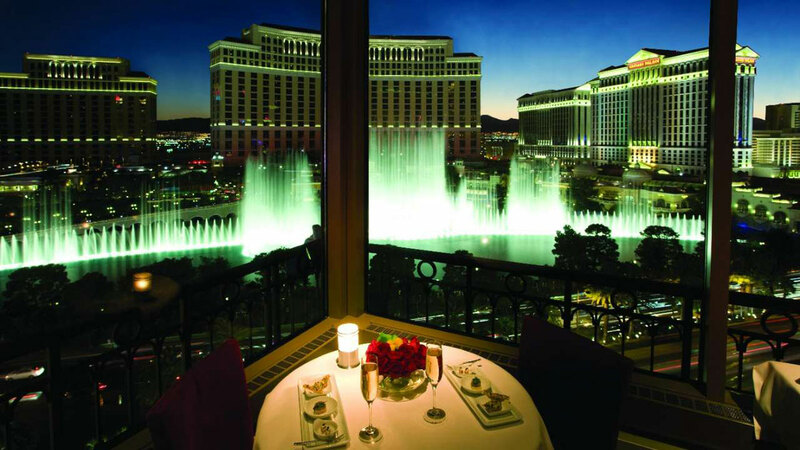 The restaurant’s massive windows offers beautiful views of the Strip and Bellagio fountains so be sure to try and get a table near them. The best part? The windows are retractable, giving guests an al fresco dining experience when the weather permits, which, lucky for us, is a large part of the year in Vegas. 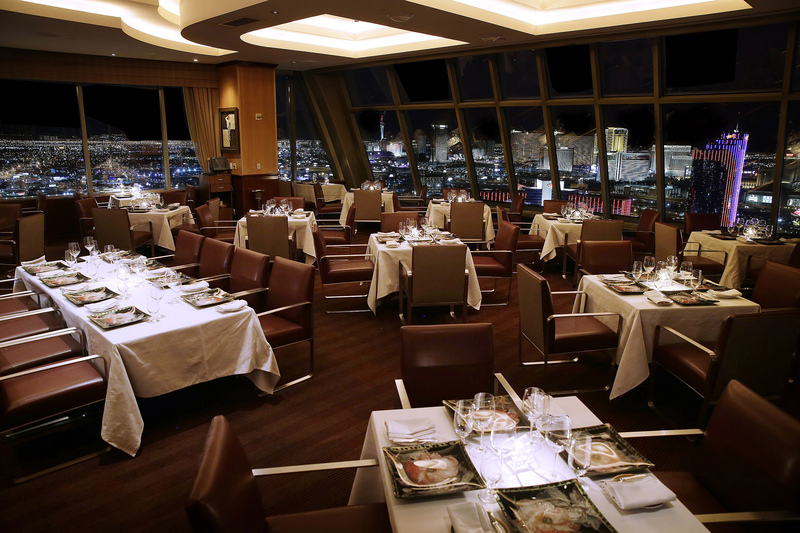 Alizé restaurant boasts one of the city’s best views of the Strip. That’s because it’s located at the Palms, which is set back a bit from Las Vegas Boulevard on Flamingo Road. The location, plus the fact that it’s located on the 56th floor, means there’s an unobstructed view of the entire Strip beneath you. The restaurant, from chef André Rochat, is sophisticaed and elegant, serving fine French food, wine and a large selection of cognacs. Want to impress a date? Bring them here. 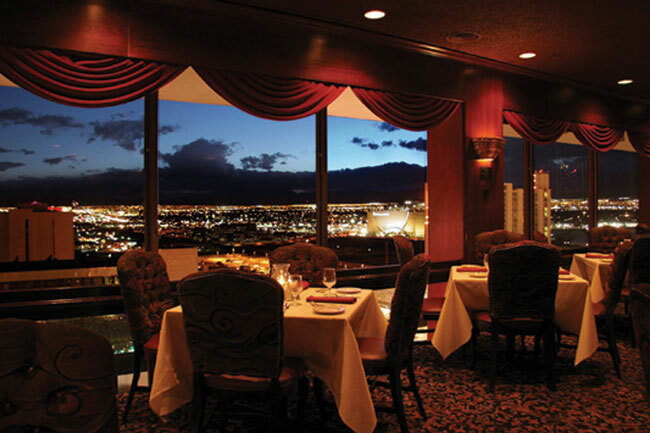 If you’re looking for an old-school vibe and a view of Downtown Las Vegas, Top of Binion’s Steakhouse is the place to go. This classic restaurant was originally part of The Mint hotel (which was built in 1957) and was called Top of the Mint. In 1988 the hotel became Binion’s Horseshoe but you can still find the restaurant, decorated in vintage Vegas décor, on the 24th floor. Enjoy views of downtown as you dine on charbroiled steaks, seafood, lamb, pork chops and chicken dishes. For dining and dancing with a view, head to VooDoo Steak, located on the 50th floor of the Rio tower. It offers spectacular views of the Strip and the city. Dine on seafood and steaks and be sure to try the signature drink, the Witch Doctor – it’s literally smokin’. The dry ice potion consists of five rums and fruit juice in a fish bowl-type glass. After dinner you can head up the staircase to the VooDoo Rooftop Nightclub on the 51st floor. Enjoy a cocktail and the outdoor patio or dance the night away. 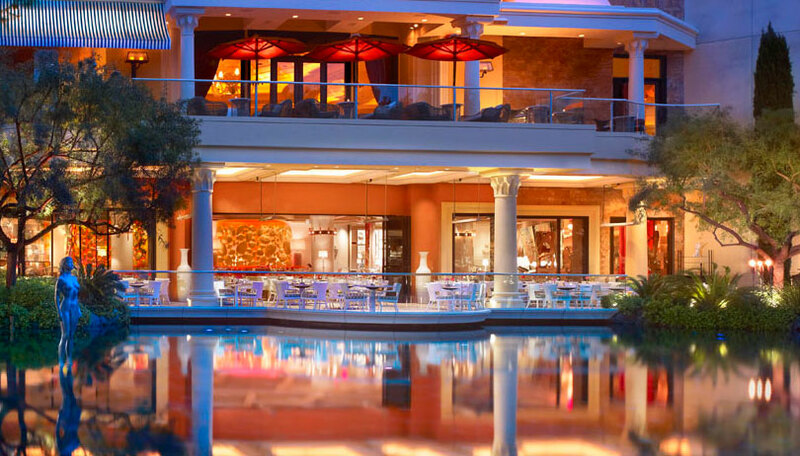 Lakeside serves fresh ocean-to-table seafood, steaks and sides with views of the Wynn’s Lake of Dreams. 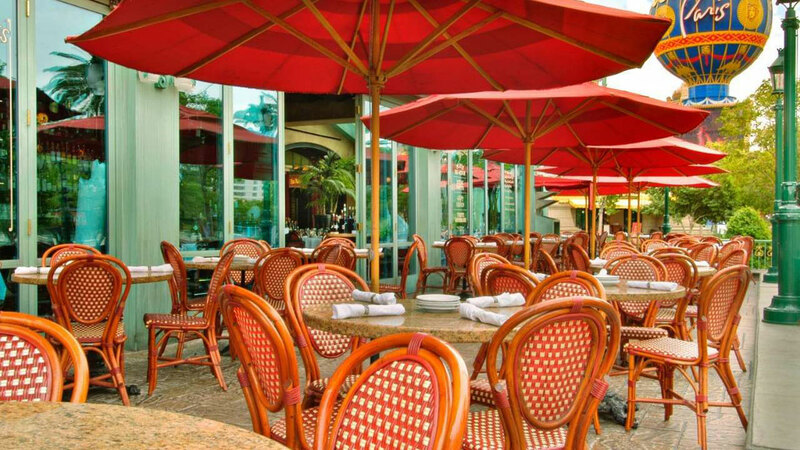 Grab a table on the patio for a front row seat to the show. The lake, which has a 40-foot-tall waterfall and a faux mountain, comes alive periodically throughout the night with music and imagery created with more than 4,000 lights, holograms and puppetry. 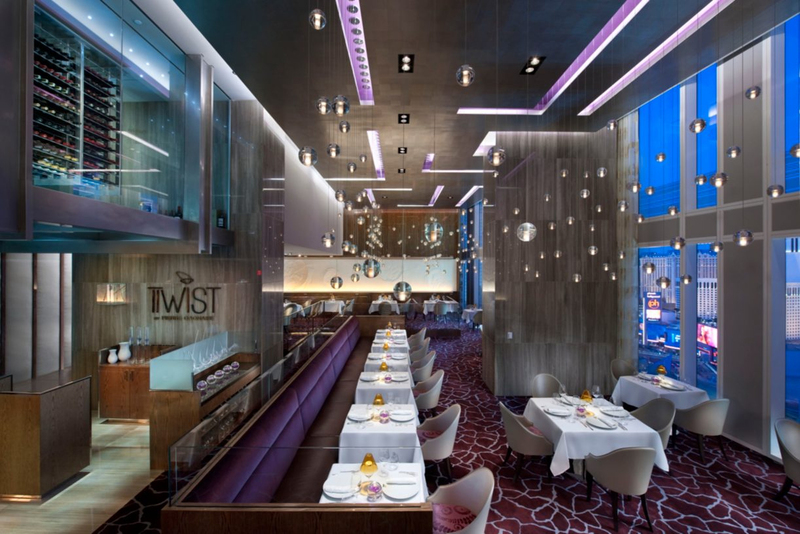 Twist restaurant, from acclaimed chef Pierre Gagnaire, offers beautiful views inside and out. The restaurant, which serves contemporary French cuisine, has a glass staircase leading up to a wine loft and has unique lighting that features more than 300 gold globes that look like they are floating across the ceiling. Twist is located on the 23rd floor of Mandarin Oriental and has floor-to-ceiling windows that offer a beautiful view of the Strip below. For a complete list of all restaurants in Vegas, check out Vegas.com’s dining section.